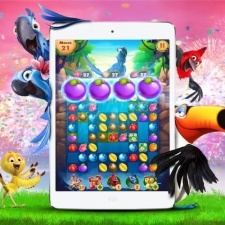 Tel Aviv-based mobile developer Plarium has revealed its second game to be launched in partnership with Twentieth Century Fox as Rio: Match 3 Party. The game is based on the popular children's animated film series Rio. As the name suggests, it is a match-3 title that promises minigames and character collection. Plarium will be making use of the license to use its characters and themes for the game. It will feature locations found in both feature-films. "Through our partnership with Fox, we're bringing a beloved animated franchise to all the fans around the globe in a completely new and compelling way," said Avi Shalel, CEO at Plarium. "The game will offer a true AAA mobile game experience that will push the limits of visual fidelity, while emphasizing the authenticity of the characters that made Rio a hit in the first place." It is not Plarium's only licensed IP due for release in 2017. Back in June 2016 it acquired the rights for a mobile game based on the film Terminator Genisys that is slated for a 2017 launch.